I'm back from a brief time out to discuss point guard play and now I want to return to talking about the Hurricane Motion Offense. In a build up to presenting what Team Hurricane does through a "virtual playbook", I'll first present some basic concepts of what inspires me offensively and show a few clips of some basic actions we like to do . So, let's hit the court running…. As discussed in an earlier entry, nearly everything we do flows out of a 3-2 set. Nearly all our movements are designed to get our players to one of those 5 spots. 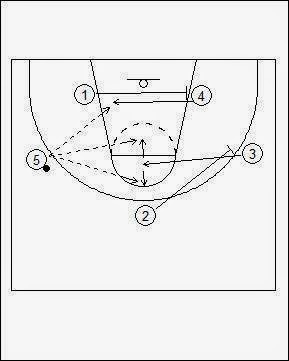 And it's from those five spots we look to score, either via the dribble drive, jump shot or lay up from the post. The other spots our motion will get us to is the Pinch Post (which is affectionately known as the Kill Zone). Today we will focus on the first two series, "LA" and Motion, as these are our two principle series that we run the most. And our "LA" and Motion Series morph into each other on any given possession. It is viable for teams that don't have a low post presence. Takes advantage of post players who are good passers. The key element to starting our offense is the renowned "UCLA" Cut. 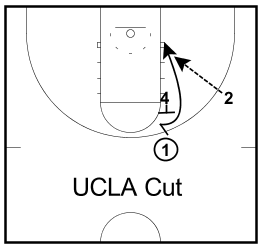 In our system the UCLA Cut is triggered when the point guard/perimeter player picks a slot on the right or left and passes to that side's wing. The player on the strong side block moves from that low post to the pinch post while the ball is the air. The point guard cuts off the high post player and all actions (motions) ensue. This "LA" Series is best seen in the way Utah Jazz under Jerry Sloan ran their offense. Now, here is a brief clip of how my youth program uses the UCLA Cut. Very basic at this stage of development, but they're getting the hang of it. 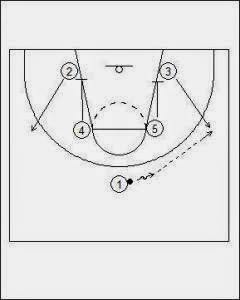 One of the LA cuts we employ is the stagger screen action that was inspired by the Utah Jazz. pass and screen away on the perimeter. 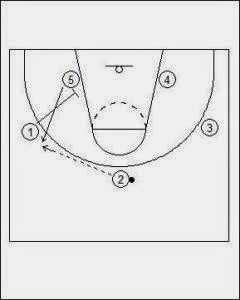 pass - flex cut screen. 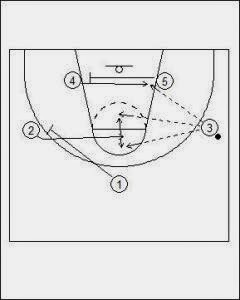 Here is a clip of the Golden State Warriors screening action that leads to scores. I like how that the initial screening action gets players into simply playing basketball. Now, here is how my young youth program in Bermuda runs some basic motion. While I'm at it let me share an early incarnation of my motion offense with my youth program in Brooklyn, Emmanuel Warriors. Many of the principles that I have shared were being developed then. The actions were pretty basic & vanilla. 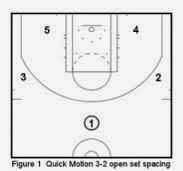 With both clips you can see our motion offense in its most basic form. I hope to be able to show more nuances to the system as we move towards creating a virtual playbook to share on this blog. Suffice to say our offense philosophy is a work in progress. It's a offense that seeks to create shot opportunities at every turn. This is not a probing/set play style offense with a required number of passes needed to be made in order to get a specific shot. What may be strange and contradictory, but it's a system offense but one which gives its players a great deal of freedom to make plays.